China’s thriving economy has attracted many people to relocate in the hope of a promising future. If you plan to move to China, one of the very first things you need to consider is where to live. China is a huge country, both in population and area. This means that there are a lot of choices for places to move. Apartment hunting in China isn’t easy, especially if you don’t speak or read Chinese. Honestly, finding an apartment in China can be an excruciating and challenging task, and if not properly done, you might end up encountering horrible housing scams and nightmares. 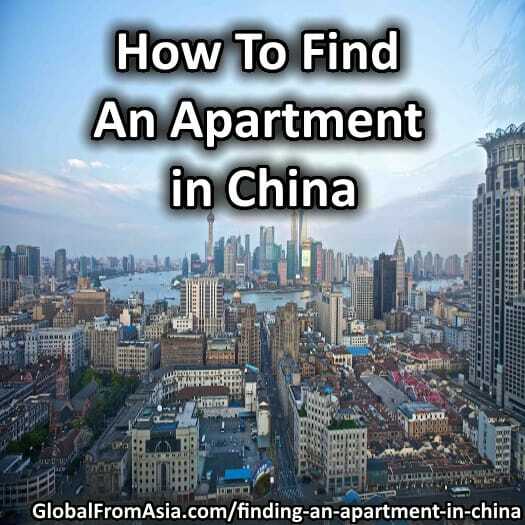 Here is some advice on apartment hunting for foreigners moving to China. Most of these websites are all in Chinese, so I suggest you use translators like Google Translate. Finding an apartment in China using these websites is actually the fastest, cheapest and easiest way to find a place to live. However, it comes with many risks including scams, like if the apartment is way too good to be true, it’s probably a scam. Of course, not all of those great deals are scams. It may be best to look for an apartment online, create a shortlist of potential apartments, and personally visit them to ensure they match expectations. 2. Hit the Streets: If you’re already in China, the best way to look for an apartment is to hit the streets. If you’re moving to China to work or study, scout out places near your workplace or school for an apartment. This may be a tiring option to hunt for an apartment but it is the most effective way to find what suits you. If you have a Chinese friend that can accompany you on your apartment-hunting, then good. If you don’t, you can always ask people nearby where to look for apartments. Fret not, most apartments for rent in China have a signage in English that says “Apartment” or “Apartment for Lease/Rent.” There are different types of apartments you might stumble upon, like the regular ones, high-end apartment complexes, villa communities and traditional Chinese housing. Each of these apartments offers different amenities and utilities — make sure to check them all out to narrow down your options. Basically, an ideal apartment should be near your workplace/school, well-maintained and reasonably priced. Once you’ve found the apartment you like, contact the landlord and discuss contracts. 3. Referrals from Chinese friends / friends living in China: If you’re lucky enough to have friends already living in China, then finding an apartment will be a lot easier. Not only they can refer apartments in China, but you can also bring along a friend that speaks Chinese to help you negotiate with Chinese landlords regarding rent and perhaps help review contracts. They can also help ask questions you may have about specific apartments and neighborhoods. 4. Real Estate Agents / Local Agency: Finding an apartment through local agents is a hassle-free way of getting what you need, but can be costly. How much does it cost? The standard agency fee is 50% of 1 month’s rent, but can be negotiable. This is ideal for people that don’t have a lot of time to find a house to rent. Agents will be able to provide you with a more options to check out in a short amount of time. You can go in and ask to see apartments that day or make an appointment to get more options. Shanghai, also known as China’s business center, is the most expensive city to live in. Meanwhile, Xi’an, Huangshan, Suzhou, Chengdu, and many others are cheaper cities. Basically, the cost of an apartment in China still depends on the size and the amenities. In cities like Shanghai, Beijing, and Shenzhen, an average apartment costs around RMB 4000 to RMB 15,000 per month, while you can get the same kind of apartment in a suburban area for just RMB 2000. Rental deposits in China range from 1 to 6 months’ rent. 1. Sign the lease contract. Make sure to thoroughly read the housing contract. Ask everything that’s unclear. Check the due dates, prices, policies, duration of contract and return of deposits. 2. Pay upfront rental deposit. This can be anything from 1 to 6 months’ rent, but frankly it isn’t ideal to pay 6 months’ rent up front – that’s simply too much. 3. If you hired a local agent, pay him/her as well. This usually costs 50% of 1 month’s rent. 4. Register your address. All homes being rented by expats must be registered with China’s Public Security Bureau (PSB). Usually your local agent does this for you, or it can be the landlord, but it’s basically your responsibility to do so. Make sure to bring along your passport with valid visa and your lease contract. Environment: The best thing to do is visit the apartment yourself before paying anything. Scope out and observe the neighbourhood on nights and weekends. Security: Check the building security measures if you must. Utilities: Water, gas, electricity, AC/heater, Internet, furniture and appliances. It’s a good deal if the apartment comes with such utilities. 2. Budget: Of course, above anything else, define what you can afford for an apartment. Living within your means is imperative. 3. Landlord/landlady: Does your landlord live on-site? If you’re an expat, make sure your landlord can at least understand English so you can easily express what you need. 4. Apartment Policies and Contract: Always ask for a bilingual rental contract.